I consider my involvement with the Society for Technical Communication as the most profound engagement of my professional career. I’ve had the opportunity to develop as a servant leader and have made a difference locally and internationally. The President’s Award honors those who have made distinguished contributions to the profession of technical communication or the Society. Today it is my great honor to present this award to someone many of you know. His outstanding contributions to STC in various roles including Rochester Chapter Co-Vice President, Scholarship Committee Chair, former Director on the STC Board, Spectrum Conference Co-Chair, STC Notebook blog contributor, Intercom guest editor, CPTC and introverted leadership study groups coordinator. 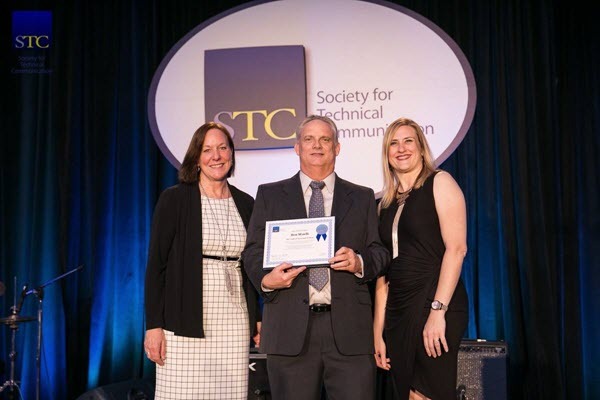 His dedication to the technical communication profession and his approach to excellence represent STC at its finest. In May 2017, STC conferred upon me the rank of Associate Fellow for having attained such eminence in the field of technical communication that I have been singled out as one of the select few who have distinguished the Society and the profession. For passionate support and mentoring of STC leaders and members by modeling servant leadership and developing innovative solutions that strengthen STC communities. I’ve been a technical communicator for more than 20 years and a leader at the local and international level in the Society for Technical Communication (STC) for more than 10 years. As Rochester Chapter president, I strengthened the chapter’s ties to the Society and engaged the chapter in the Community Achievement and Pacesetter Awards. Rochester has since been recognized as Community of the Year twice in four years. I began my Society-level service with the Community Affairs Committee, where I created and led an outreach team to support community leaders, and later served as committee chair. I actively seek to develop innovative and sustainable practices to help STC communities become stronger.